Please click the link above to read the March-April 2014 Freethought Society Newsletter. The Freethought Society has had an exciting and very active past few months, and we are pleased to bring you reports, photos and ideas. We hope that you will remain or become an active supporter of the great work we are doing. Please consider donating to the general fund or select a project you want to help sponsor. All donations to the Freethought Society are tax-deductible! 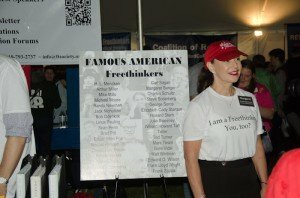 If our newsletter inspires you to become more actively involved with the Freethought Society, please provide us with your contact information including your phone number and mailing address. Special events are being planned in your area so don’t miss an opportunity to participate further. All personal information is confidential and will not be shared with other organizations.